Hey friends!! Now that summer vacation is upon us things have slowed down a bit and I have found some time to make a card or two... YAY! 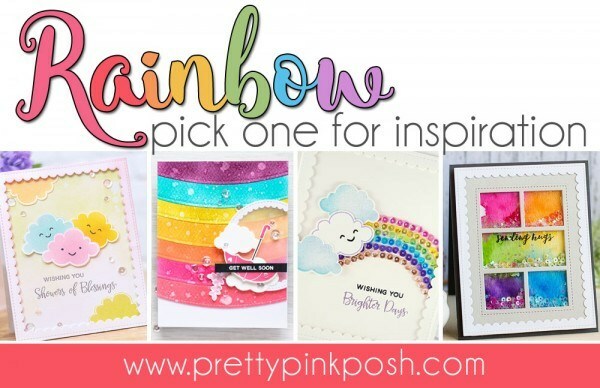 Pretty Pink Posh has a rainbow card challenge going on and I really wanted to play along using the PTI mini Make It Market kit Sunshine and Rainbows. I pretty much love anything that Yana Smakula makes and so I used her card as my inspiration. I didn't do layers of die cuts like she did, but I did ink up my watercolor cardstock using the PTI stencils and then sprinkled on some water when I was done to achieve the same look. Creating the rainbow takes two stencils and so I had to make sure that I was careful to get the colors in the correct order as I did the inking. (You know ROY G BIV - red, orange, yellow, green, blue, indigo and violet. No indigo or violet as the rainbow stencils only allow for five colors.) Once that was done I die cut the panel down to a smaller size. The word "sunshine", the swing and the bird are all pre-printed images that are included in the kit. I just die cut the ones I wanted and I was done. I stamped the sentiment "Wishing you" from the set in VersaFine Onyx Black and then adhered the word. I thought about die cutting a few more and stacking them, but decided to just leave it as is. The little swing was adhered to the clouds and then the bird popped up with a pop dot. I added the second half of the sentiment after I had actually finished the card and thankfully it stamped nicely for me! The finishing touch was to add some Pretty Pink Posh sparkling clear sequins in two different sizes. I will be posting this card to the current Paper Players challenge (CAS celebration - I think this is a pretty clean and simple design), as well as the current Simon Says Stamp Wednesday challenge. At the suggestion of my bloggy friend, Karren, I'm adding this to the Virginia's View Summer challenge. I like your pretty rainbow Rosemary, this is marvelous!! This rainbow card is so pretty! I love the bird swinging from the clouds! 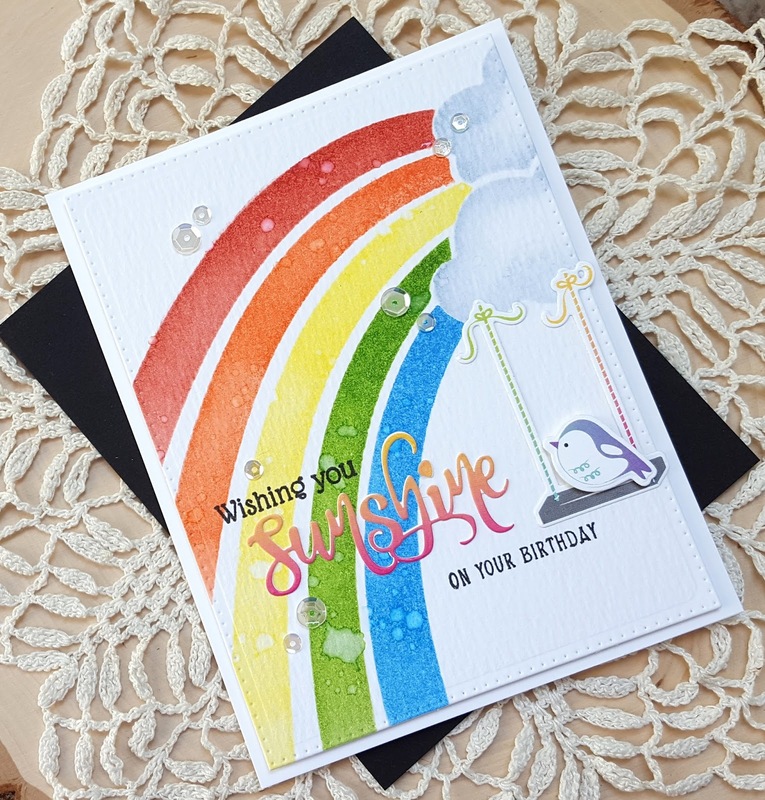 WOW, Rosemary, what a fabulous Rainbow card! Love, love, love your fun rainbow card, Rosemary--beautifully created! What a bright and cheery card Rosemary - I love your stencilled rainbow and swinging birdie. Thanks for joining us over at The Paper Players this week for our 300th celebrations! Beautiful, bright and cheerful! PS: You should also link this up to Virginia's View summer challenge. I adore this card! I have a thing for rainbows!! Absolutely adorable card, Rosemary. Beautiful stencilling. Love the water drops and the perfect placement of the sentiment and images. Thank you for celebrating PP300 with us at The Paper Players! This card is adorable and a true work of art. I'm looking at all the detail you put into it and am in awe! Thank you for joining along in the rainbow challenge! Wow! Your rainbow is just gorgeous!!! I LOVE that sweet little birdie on the swing coming down from the cloud! Adorable! & the sequins are the perfect added touch!! Oh, my gosh! I absolutely LOVE your rainbow. The adorable bird swinging from the cloud is so sweet! Thank you for joining The Paper Players in our 300th challenge! Beautiful card - and fabulous use of color! From the rainbow, to the sentiment, to the strings on the swing - perfect combinations! So glad you joined the Rainbow Challenge at PPP!!! 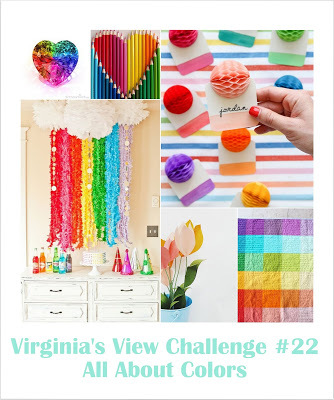 So glad that you join the fun over Virginia’s View “All about Colors” Challenge! WONDERFUL!